Stephanie’s understanding of motion and her 18 years of experience as a Physiotherapist in dealing with acute, chronic, sports, ante- and post-natal and hyper-mobile patients, has allowed her to successfully diagnose and treat patients with a keen eye for detail. Stephanie graduated from University of Sydney in 2001 and has predominantly worked in the private sector. Her private practice journey started at a sports clinic treating acute musculoskeletal injuries and being involved with sporting teams including rugby, hockey and soccer. She then worked with Dr Barbara Hungerford in a specialized spinal clinic, treating complex pelvic/rib injuries and chronic pain patients. Using a holistic methodology and utilizing manual techniques such as muscle energy techniques, cranial sacral therapy and real time ultrasound to aid with specific muscle/ functional task retraining. Stephanie is a great believer in the active management of injuries. She has special interests in soccer, cycling, running, hockey, basketball, dance, golf, martial arts and snow sports. She personally enjoys doing Pilates and Barre classes. She has trained with APPI (The Australian Physiotherapy and Pilates Institute) in their matwork pilates, equipment pilates, ante- and post-natal pilates and Barre courses. She has also been involved in designing sports specific pilates programmes for golfers, basketballers and sprinters. Stephanie has also completed a course in dry needling and has competed the ConnectTherapyTM Series and is continually seeking innovative ways to add to her skill-set to consult with patients in a holistic manner to not only treat the symptoms of pain or discomfort, but to find the root cause of the issue. Whether you are just looking to manage an injury, improve your body awareness and optimise motion, or to further enjoy your chosen activities, Stephanie is looking forward to see how she can assist you. Stephanie works part-time. 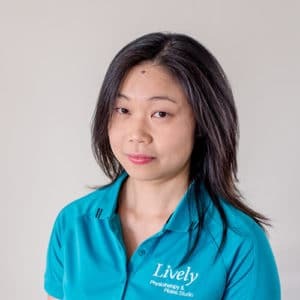 She is available for Physiotherapy treatment on Tuesday all day, Wednesday and Thursday afternoons, and teaches PEP on Wednesday morning and Thursday afternoon.